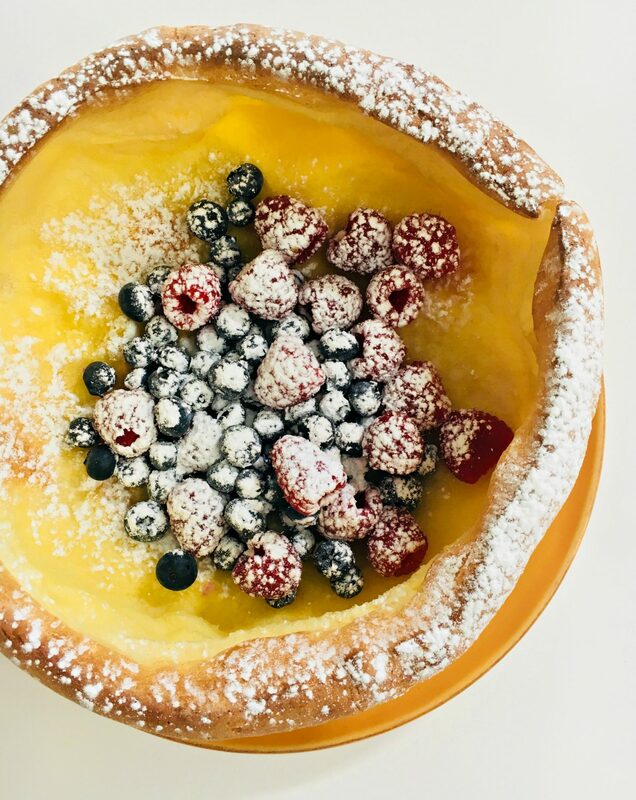 So hey, who loves a Dutch baby? 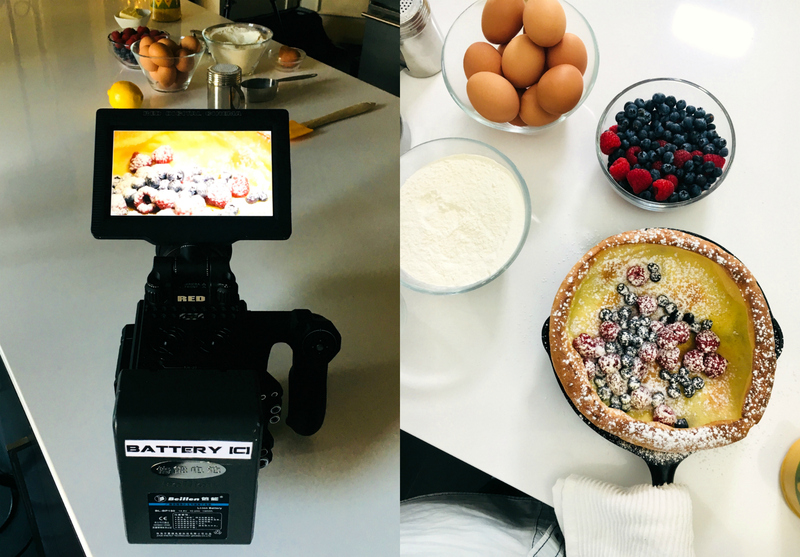 I’ve partnered with EggcentricTV and the folks at Egg Farmers of Canada to make a video tutorial on how to make one, taking took over my parents’ (brand new!) kitchen to talk about one of our favourite sharable recipes for their #RecipesThatGive campaign in support of Food Banks Canada. Feeding people is important to me, particularly at this time of year when we all love to gather around food, and yet so many members of our community are feeling the pinch. 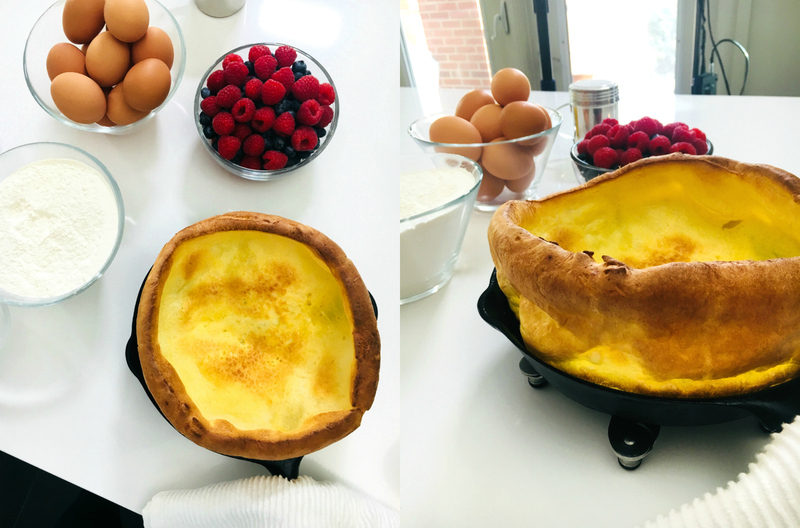 I chose a Dutch baby – a puffed pancake you bake in the oven, and one of my favourite things to make year-round but especially during the holidays, when I like a little added drama but minimal work. It’s fast and affordable – whisk together three eggs, half a cup of milk and another of flour and bake in a preheated pan in a hot oven and voilà – it’s like an enormous Yorkshire pudding you can fill with berries for a festive brunch, dab with butter and drizzle with maple syrup on a sleepy morning, fill it with ice cream and hot fudge sauce for the ultimate group sundae, or go savoury and load up with something saucy: think butter chicken or turkey dinner leftovers, doused in gravy. It’s far less fussy than waffles or pancakes, and I can’t think of a better way to repurpose all kinds of leftovers. It’s amazing how one simple dish can bring people together and spread so much joy – I love the idea of making something memorable, something that comes out of the oven with a unique character each time you make it. And it’s the kind of thing that makes people feel special when you bake it for them, no matter how easy it is. Once you’ve made it, you’ll have the three ingredients down pat and won’t even need to look anything up. 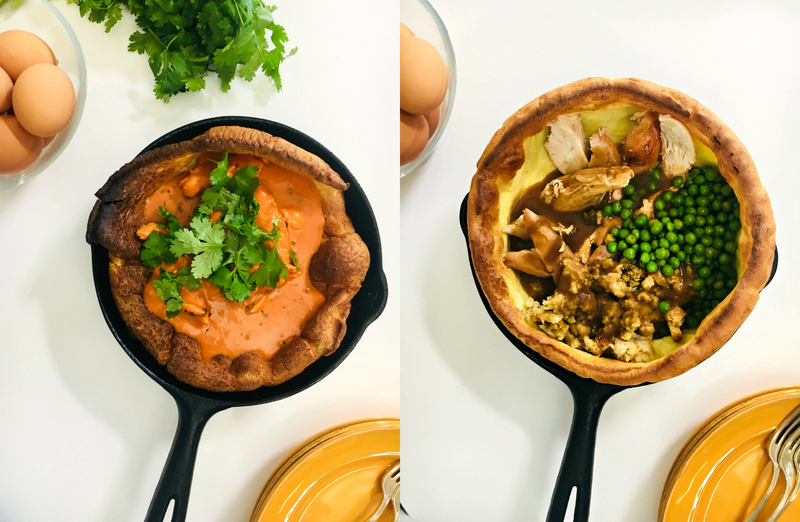 These are all outtakes from our shoot, which was a blast, not least of all because we ate all the Dutch babies I made and there was a cameo by a giant chicken. You can watch the full video by downloading the (free!) EggcentricTV app (available thru the App Store, Google Play and Roku) and go to the Holiday RecipesThatGive channel! The video spells out the recipe, but you can also find the recipe itself on the eggs.ca website. 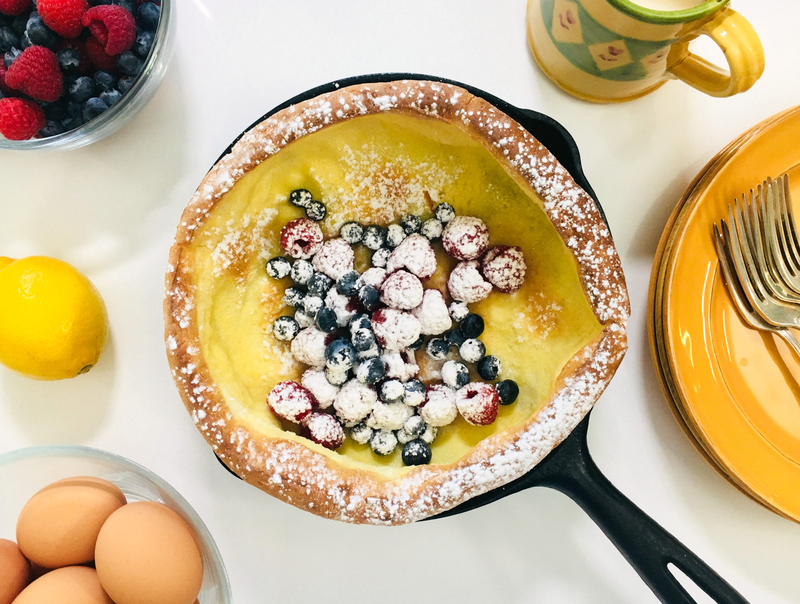 Honestly, it’s the easiest thing – once you make a Dutch baby, you’ll start finding all kinds of excuses to make it again. I mean, look at this. Think of all the delicious things you could pile in here! HI! Julie! 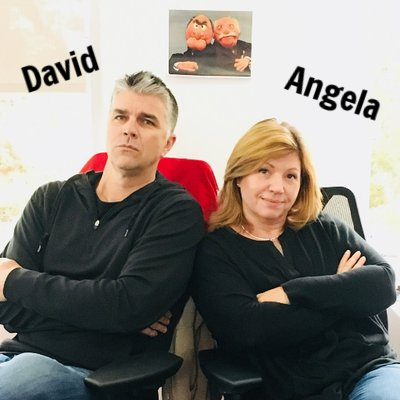 Love your receipies as well as your enthusiasm on the radio. Heard you mention your grandmother, Woodall in Windsor Ontario. I moved there from Edmonton in 1974 where my husband was minister of Riverside United Church for 24 years. John and Miriam Woodall were in our congregation. In fact my husband performed the burial service of their tiny babyabout 1979. Know there were two families of Woodalls in the city. One looked after all the linens at St Mary’s Anglican church. Now I live east of Red Deer. Keep up the lovely recipies.